Provide comfort for the family of Mary Buell with a meaningful gesture of sympathy. Mary Evelyn Bleau Baker Buell, entered peacefully into the Arms of the Lord on Saturday, January 26, 2019 at the age of 84, surrounded by her loving family. Philonise (Roy) Bleau. She received her education at Benn High. In early years, she was employed at Nancy's Shoes, Sardiff Nursing Home, and Green Mountain Race Track. She was united in holy matrimony at St. Francis De Sales Church to Dwain Baker of Danby, VT on May 31, 1952. This union was blessed with 7 children. Dwain predeceased her in 1960 and an infant son predeceased her in 1961. She was a beautiful woman who embraced the simple pleasures in life: Watching old reruns of I Love Lucy, Iron Side, Bonanza, Perry Mason, Gun Smoke, Mash, and Andy Griffith. In her younger days she loved to cook, play cards especially rummy and war, and watching the kids play outside. Her greatest joy was her family and enjoyed spending time with her children and grandchildren. She married Alfred Buell of North Bennington, VT on June 18, 1972 in North Bennington. Alfred passed on July 14, 1997. She is predeceased in death by her Brother Charles Francis Bleau in 2006 and stepson David Buell in 1995. Survivors include her 6 children, Shirley Baker of Bennington, VT, Charles (Chuck) Baker and his wife Joanne of Shaftsbury, VT, Duane Baker of Bennington, VT, Paul Baker and his wife Catherine of Buskirk, NY, Joseph Baker and his wife Dorothy of Pownal, VT, Darlene Munsey and Jeff Griffis of Bennington, VT. Seven stepchildren, Arthur (Bing) Buell and his wife Gail of North Bennington, VT, Terry Buell and his wife Cheryl of Bennington, VT, Tony Buell and his wife Casandra of North Carolina, Alfred (Biff) Buell of Bennington, VT, Willard Buell of Pownal, VT, Robin Buell of Bennington, VT and Charlotte Brown and her husband Louie of North Bennington, VT. Plus many grandchildren, great grandchildren, great-great grandchildren and Uncle Francis (Pete) Roy of Bennington, VT, along with her many nephews and nieces. All of those who she loved and touched deeply. Funeral service will be held Friday, February 1, 2019 at 1:00pm at Mahar and Son Funeral Home in Bennington, Vermont. Burial will take place in the family lot in the Village Cemetery in the Spring. Contributions may be made to Sacred Heart School through the office of Mahar and Son Funeral Home, 628 Main Street, Bennington, VT 05201. 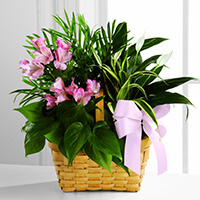 To send flowers in memory of Mary Baker Buell (Bleau), please visit our Heartfelt Sympathies Store. Your Mack Family sent flowers to the family of Mary Baker Buell (Bleau). Wishing you peace to bring you comfort, courage to face the days ahead, and loving memories to forever hold in your heart. Your Mack Family purchased the The FTD Living Spirit Dishgarden for the family of Mary Buell.